Although the parts list calls for a ten-segment LED unit, the illustration shows two individual LEDs being used instead. This is due to lack of room on my breadboard to mount the switch assembly, two integrated circuits, and the bargraph. If you have room on your breadboard, feel free to use the bargraph as called for in the parts list, and as shown in prior latch circuits. 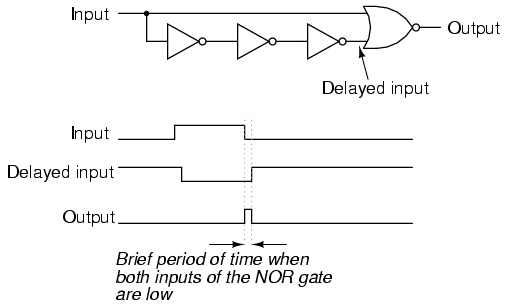 Normally, when using a NOR gate as an inverter, one input would be grounded while the other acts as the inverter input, to minimize input capacitance and increase speed. Here, however, slow response is desired, and so I parallel the NOR inputs to make inverters rather than use the more conventional method. Please note that this particular pulse detector circuit produces a "high" output pulse at every falling edge of the clock (input) signal. This means that the flip-flop circuit should be responsive to the Set and Reset input states only when the middle switch is moved from "on" to "off," not from "off" to "on." 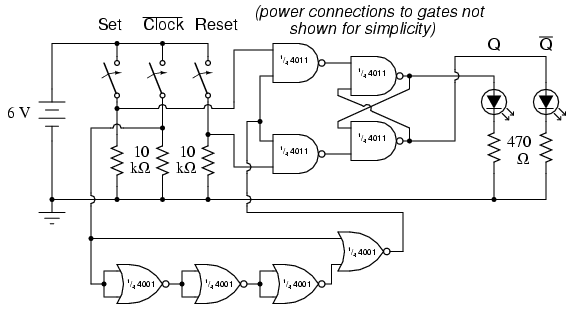 When you build this circuit, though, you may discover that the outputs respond to Set and Reset input signals during both transitions of the Clock input, not just when it is switched from a "high" state to a "low" state. The reason for this is contact bounce: the effect of a mechanical switch rapidly making-and-breaking when its contacts are first closed, due to the elastic collision of the metal contact pads. Instead of the Clock switch producing a single, clean low-to-high signal transition when closed, there will most likely be several low-high-low "cycles" as the contact pads "bounce" upon off-to-on actuation. The first high-to-low transition caused by bouncing will trigger the pulse detector circuit, enabling the S-R latch for that moment in time, making it responsive to the Set and Reset inputs. Ideally, of course, switches are perfect and bounce-free. In the real world, though, contact bounce is a very common problem for digital gate circuits operated by switch inputs, and must be understood well if it is to be overcome.